There are three primary reasons why people start collecting scrap metal for recycling. The first is a sense of “doing the right thing” in recycling metals, plastics and paper for the benefit of the environment. The second is to earn a little bit of pocket money by returning cans, bottles and other things of value to the local recycling center. The third is from a business point of view, learning how to find, identify, sort and sell scrap metal in Westport for a profit. While we have talked a lot about the first and second type of scrapping in Massachusetts within this blog in the past, today we are going to address the professional scrapper and talk about what is needed in order to start a scrap metal business in New England. The first thing you need to understand is that there is money to be found in learning how to collect and sell scrap metal. Scrapping, as it is known within the industry, can be a home-based business or a larger scale operation, depending on the amount of time you put into it and your goals for the future. Studies have shown that the average person who owns a truck and dedicates a full-time work day to scrapping in Massachusetts can make as much as $42,000 a year. Part-timer scrappers who spend time collecting scrap metal on weekends or after work hours can pull in anywhere between $10-15,000 a year. Knowledge is key to increasing the amount of money that you are able to make when you take your haul to sell scrap metal in Westport. Learning to identify the different types of metal, sorting them to your best benefit and knowing when to bring them in to sell is a learned skill that can sometimes take some time. Understanding what abandoned appliances are a good source of scrap aluminum, copper or steel, can mean the difference between a big payday or a missed opportunity. The more you can learn about scrap metal and the business as a whole, the more successful your scrap metal business will be. In any business, it is important to know the value and worth of what it is that you are selling. Collecting scrap metal can sometimes mean putting away a bin or bucket of scrap pieces until the value goes up or quickly taking your items to sell as scrap right away while the market rate is good. Calling your local scrap metal recycling facility is one way to know what the current going rate is for copper, steel, aluminum and other popular metals. However, you can also follow the global market report to gain some extra insight that will help you set strategic goals when collecting scrap metal for your business. One example of extreme changes in value for a specific metal is copper. Just 15 years ago, copper was worth approximately 50-cents a pound. It was higher paying that some metals, but not worth as much as others. Supply and demand plays a big part in the world of scrapping in Massachusetts. As global demands for copper went up with the increase in building and modernization in certain countries throughout Asia, the price of copper went up as well. By 2006, scrappers were selling copper on a regular basis for as much as $2.80 a pound, nearly six times the value just a few years before. Today, copper values are still holding, making it a highly valued type of metal in the scrapping world. Before you can even bring your haul in to sell scrap metal in Westport, it is important to sort it out by type. 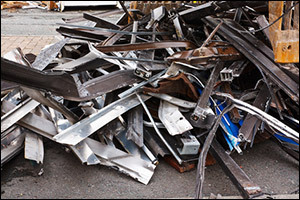 The more you sort your scrap metal, the better price you will get for it. Taking time to learn the way that your local scrap metal recycling facility likes to have metals sorted is really worth the effort. While most people know that the primary sorting stage is separating the ferrous metals from the non-ferrous metals, the average person doesn’t know much more beyond that. Because you get paid more for having scrap metal that is more expensive than others, it is important to know the difference. These are just a few of the examples of the types of metal that you will find while scrapping in Massachusetts. Aluminum, for example, may only be at the mid value range, but it is found more frequently than copper or nickel. Locating a reliable source of scrap aluminum or other valuable metals can help to catapult your scrap metal business to success. Take time to study photos of different types of metals, read all you can about various properties you can use to identify them from similar metals and don’t be afraid to ask questions about the metals that you have collected when you go to your local scrap metal recycling facility. Mid City Scrap Iron and Salvage is located in Westport, Massachusetts and serves the needs of professional scrappers, casual collectors and residential customers throughout the South Coast region, including Rhode Island, Southeastern Massachusetts and Cape Cod. Family owned and operated for generations, Mid City Scrap is a great place for those who are collecting scrap metal within the region to come and sell their haul. For more information about Mid City Scrap, please continue reading our website or give us a call at 1-800-334-4789.